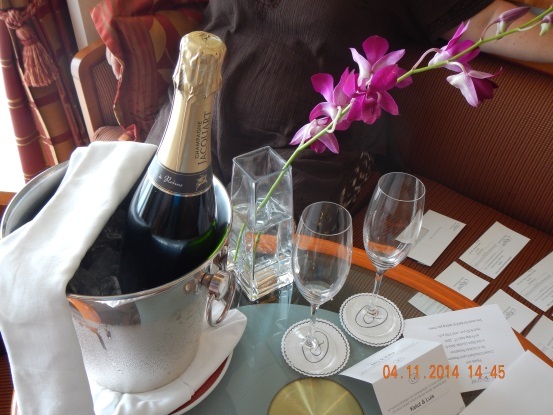 This spring I had the opportunity to sail on the Regent Seven Seas Navigator. Our cruise was for 10 days and we sailed from Miami. We sailed to the Bahamas, spent 3 days in Bermuda, a day in Charleston, a day in Port Canaveral, and then back to Miami. 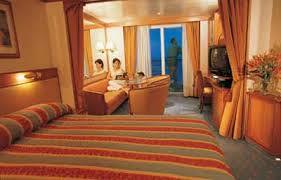 Regent Seven Seas Cruise Line is an ultra-deluxe, luxury cruise line. There are three ships in their fleet with a brand new ship currently being built. There is no other cruise line out there offering as many inclusions as Regent does. You won’t find any pre-cooked banquet quality meals on Regent since everything is cooked to order. Wine, beer, cocktails, sodas, bottled water, gratuities, a daily restocked fridge in your suite, specialty dining room experiences, shore excursions, and airfare to the ship are all included. If you book an upscale category they will even include a FREE 1-night hotel stay prior to the cruise and many times will offer huge discounts on business class airfare. The ship was very elegant and there were never any major crowds to deal with. All of crew was very friendly and accommodating. You couldn’t ask for anything more. The Navigator accommodates just 490 pampered guests. When we arrived to the pier there were several folks checking in the arriving guests so the wait time was very minimal. Within 15 minutes we went from the cab to our suite on the ship. This is one of the major benefits of being on a ship with fewer passengers. 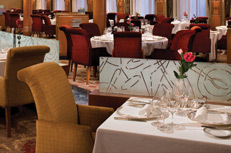 Compass Rose Restaurant – This is the main dining room on the ship. Breakfast, lunch and dinner are all served in this beautiful dining room. All the food is very delicious and beautifully presented. Breakfast is pretty typical with some great traditional selections such as Eggs Benedict, eggs to order, fresh pastries and other selections such as fresh poached figs, fresh fruits, berries, melons, gravlax, kippers and much more. Each morning we had a choice of fresh squeezed orange juice and grapefruit juice. Lunch and dinner was also wonderful with some old time favorites and daily new creations from the Chef. It’s very important to note that unlike ships which hold 2,000-5,000 people all the food is cooked to order on Regent. This means that your steak and lobster tail will not be cooked until you order it. One of the other great things about Regent is that if you really like a menu item a lot and you want to try it again on a different day all you have to do is give them a one day notice and they will make it for you. Full bar service is always included in the dining room. So if you are in the mood for a mimosa, a glass of wine, a beer, or a cocktail it’s all there for you. reserve one dinner reservation prior to boarding the ship. You may visit the Maitre’d once on board to see if he can get you in for an additional evening if you like. The food was extra amazing in this restaurant. 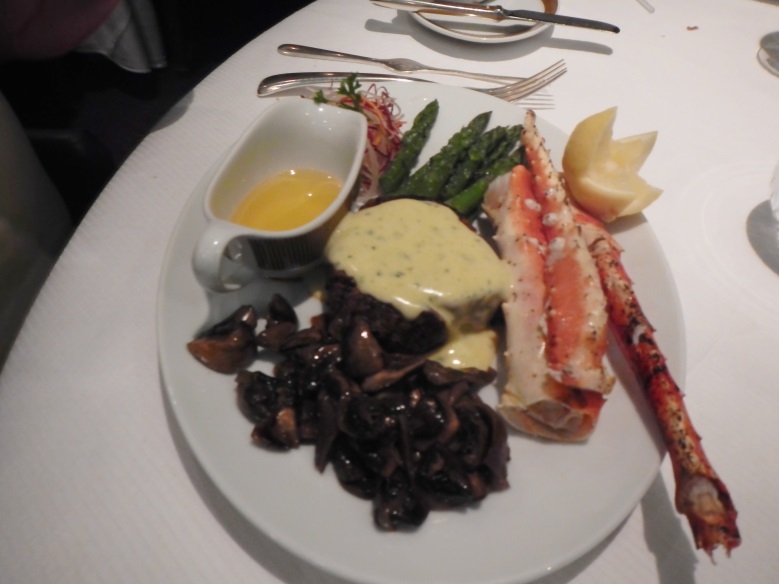 I had the Surf and Turf with filet mignon and Béarnaise sauce with Alaskan king crab legs. My wife just ordered the Alaska King Crab legs. They offered to serve it in the shell or out of the shell. The stack of crab legs was enormous. The dining room experience and the food were so good that many folks just like us ate there twice during our cruise. La Veranda – This is the more casual restaurant on board. During breakfast and lunch they offer a very nice buffet spread. Once again full bar service is available. For dinner La Veranda transforms into a great Italian restaurant, Sette Mari. Reservations are not required and it is first come, first serve. Dinner starts off with a nice selection of hot and cold appetizers, salads and soups all served buffet style. Then a menu with a wide array of Italian main courses is offered by your waiter. Regional red and white wines along with a full bar service is all offered during dinner. The Poolside Grille – Each morning they served a very nice continental breakfast with a selection of hot and cold items. During lunch the standard items such as hamburgers, hot dogs, hot sandwiches and grilled fish were served. One day they served an incredible Kobe beef kabob that was amazing. In-Suite Dining – Regent is one of the few cruise lines which will allow you to order anything off the main dining room menu for room service. One afternoon we ordered a gourmet cheese plate with two jumbo shrimp cocktails and a bottle of wine, just because we could. They served it to us on our balcony…. boy, did we feel like rock stars that day!!! Another evening we decided to have dinner in our suite. The whole 5 course meal was delivered to our suite on fine china complete with a white tablecloth, a vase of fresh flowers, and of course our bottle of favorite wine. Most everything is included in a Regent cruise. We started off each morning with a gourmet coffee like you would typically get at Starbucks but we didn’t have to pay $6 for it. And if you want to add some Kahlua or Bailey’s to it you could do so. No matter if you are in the dining room, in a lounge, or out by the pool you could get any cocktail of your liking throughout the day. When we first entered our cabin we had a chilled bottle of champagne waiting for us, a stocked fridge which gets refilled each day with a selection of bottled water, sodas, and beer. And if you request a liter of your favorite adult beverage they will accommodate you with a complimentary bottle. As you relax on the pool deck one of the great crew members will come over and ask you if you would like something from the bar so you don’t even have to get out of your chair to get a drink. Now that’s what I call service. During lunch and dinner service in the main dining room the wine sommeliers offered a featured red and white wine of the day. The wine flowed freely. If you don’t care for the daily wine choice, no problem, just ask them for something else. 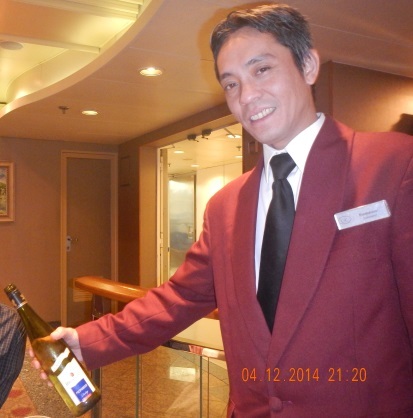 My wife loves a sweeter German Riesling and she had that with each lunch and dinner throughout the cruise. All the cabins are considered suites with the smallest cabins measuring a very spacious 301 square feet. 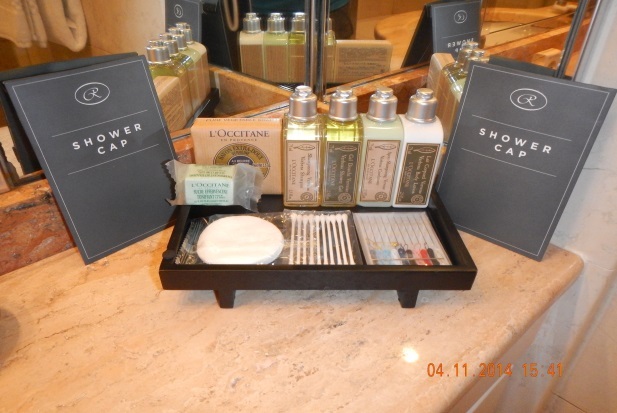 The restrooms are all marble with high-end toiletries, plush robes, a large walk-in closet, a long hallway entrance, a nice size balcony, a safe, a daily restocked fruit basket, fresh orchids, a DVD player with a huge complimentary video library, gourmet chocolates each night and more. The Concierge suites and above even include a personal expresso maker and a cashmere throw. Down the hall from our suite was a self-service complimentary laundry room complete with washers, dryers, irons, and ironing boards. A pool deck party with dinner and music under the stars. Every night in the main show lounge they put on an elaborate production show. A couple of evenings they had Broadway style reviews, plus original shows like the “Piano Men”, a show featuring the songs from Elton John and Billy Joel. Several lounges offered live piano music with cabaret singers. High tea was served each day with fresh made pastries, scones, and sandwiches. And besides a wide selection of gourmet teas, the champagne was flowing and the bar was open. The last night of the cruise was the most fun. After spending 10 days on board getting to know the crew, the singers and the dancers, and the other passengers they had a “Beatles Tribute” party. We all let our hair down while we mingled, sang, danced and partied with all our new friends. What a great finale to a great cruise. It is important to note that the level of daytime and night time entertainment is somewhat limited and subdued compared to what larger mass market cruise lines offer. Regent clients are typically more mature in age, highly educated, and well- traveled. They would rather play bridge, go to wine tastings, cooking classes, attend the seminars put on by the guest lecturers, read a book, or socialize with fellow guests. You won’t see any crazy pool games on this cruise line. Regent includes complimentary shore excursions in each and every port. These can be reserved in advance before you even board the ship. The shore excursion selection is large and you shouldn’t have any problem finding a tour to suit your interest level. Depending on the length of your tour you could even possibly squeeze in a second FREE excursion with time permitting. Some of the very expensive tours such as helicopter rides are not included but they are heavily discounted. All of the vehicles they used were very nice and spacious. Sometimes large coaches were used and other times we had nice size mini-vans with just two couples per vehicle. Instead of making you wait on the dock in the hot sun all the shore excursions gather in the show lounge until your tour is ready to depart. On many of the itineraries Regent will stay in port late at night or sometimes for 2 to 3 days as we did in Bermuda. A huge benefit that is hard to put a price tag on is being able to dock in the heart of town since our ship is smaller. In Bermuda we were able to dock in downtown Hamilton and were across the street from all the downtown attractions. Othe r larger ships have to dock in Kings Wharf on the northwestern point of the island. Each passenger on those larger ships has to waste a lot of valuable time and money getting back and forth to downtown Hamilton. Once again with such a small head count of passengers the disembarkation process was a breeze. This entry was posted in Uncategorized by The Cruise Butler - Travel agency. Bookmark the permalink.